... we have the first U.S. trailer for the long-awaited In This Corner Of The World, coming Stateside thanks to Funimation and Shout! Factory. For those of you headed to Otakon, it'll be screening there. Later this month, Fathom Events will be bringing the first of many Studio Ghibli films to theaters for one-night engagements. 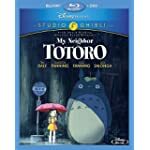 This June 25th, we have My Neighbor Totoro, a favorite of mine. See it with a family — yours, or someone else's, and then grab a copy. If there's any one Ghibli film that you can add to a collection without the slightest hesitation, this is it. Because Discotek's most recent set of announcements are flabbergasting: both Galaxy Express 999 feature films (me, the Leiji Matsumoto fan, is turning cartwheels), Masaaki Yuasa (Mind Game)'s long-unavailable Kaiba, and Studio 4°C's mind-melting HELLS. I imported the last from Japan on my own and was originally going to review it in fairly short order, but I'm going to hold off until the U.S. version is out, because this is one truly weird piece of work. The first season of The Eccentric Family, about which I couldn't say enough good things. Given that for a while the only way to see the first season was via the now-out-of-print NIS America box set, this is an opportunity to jump on. Red Data Girl, a good series that is somewhat shy of being a great one, but still worth seeing. The original anime adaptation of the nihilistic Gantz. My original reaction to this version of the material was "no good deed goes unpunished", but maybe that's more a limitation of the packaging (it's not like they could adapt the whole thing, since the original manga was still in progress at the time) than the material's intentions. The recent CGI version isn't bad, but the live-action version is eminently missable. Gurren Lagann is one of the crown jewels in Aniplex's treasury; small wonder they exercise such tight-fisted control over it and refuse to license it out on physical media to another distributor in the U.S. Those who missed out on grabbing the previous Blu-ray release (for which I spent roughly the gross domestic product of a small country to acquire), take heed: a new box set is set to come out later this year for only (ONLY!) $189 list. I'm betting the actual retail price will be around $130; Aniplex is offering it for $150 direct from their store. And now I have the perfect excuse to circle back to that title, come August. 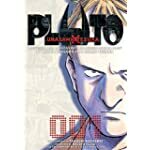 Pluto is not Mickey's dog; it's a retelling of Osamu Tezuka's Astro-Boy, by Naoki (Monster) Urasawa that is to that story the way Batman Begins was to prior Batman incarnations. Apparently there is an as-yet-unannounced anime adaptation of it in the works. If you haven't yet read Pluto, do it. It exists on a plane that has less to do with a cynical attempt to cash in on the centennial of a celebrated artist, and more to do with taking where that artist's ambitions left off and pushing them into entirely new directions. This project cannot come out soon enough for me. Under the bill, terrorist groups or criminal organizations could be punished for the planning of 277 crimes, which range from arson to copyright violation. ... The general public is split on the need for the law, with about 40 percent in favor and the same proportion against it in a Kyodo News poll conducted last month. More than 77 percent said further explanation was needed. It's not being received well, in big part because its scope is impossibly broad. Merely "planning" a copyright violation — whatever that means — could lead to an arrest under the new law.